Conventional methods for producing standard scores in psychometrics or biometrics are often plagued with "jumps" or "gaps" (i.e., discontinuities) in norm tables and low confidence for assessing extreme scores. The continuous norming method introduced by A. Lenhard et al. 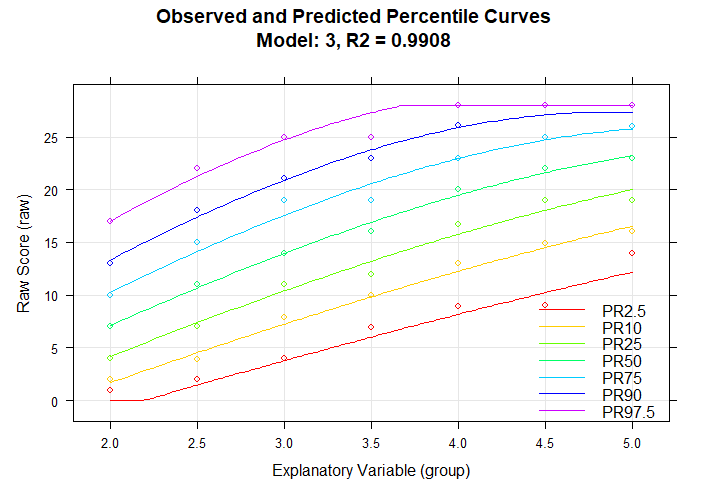 (2016), , generates continuous test norm scores on the basis of the raw data from standardization samples, without requiring assumptions about the distribution of the raw data: Norm scores are directly established from raw data by modeling the latter ones as a function of both percentile scores and an explanatory variable (e.g., age). The method minimizes bias arising from sampling and measurement error, while handling marked deviations from normality, addressing bottom or ceiling effects and capturing almost all of the variance in the original norm data sample. Conventional methods for producing test norms are often plagued with "jumps" or "gaps" (i.e., discontinuities) in norm tables and low confidence for assessing extreme scores. cNORM addresses these problems and also has the added advantage of not requiring assumptions about the distribution of the raw data: The standard scores are established from raw data by modeling the latter ones as a function of both percentile scores and an explanatory variable (e.g., age) through Taylor polynomials. The method minimizes bias arising from sampling and measurement error, while handling marked deviations from normality – such as are commonplace in clinical samples. Contrary to parametric approaches, it does not rely on distribution assumptions of the initial norm data and is thus a very robust approach in generating norm tables. Please report errors. Suggestions for improvement are always welcome! cNORM offers function for all of these steps, helps in selecting the best fitting models and in generating the norm tables. # please use cNORM on the console. # number of predictors up to 14 predictors. # Cross validation of number of terms with 20% of the data for validation and 80% training. In this example, a Taylor polynomial with power k = 4 was computed in order to model a sample of the ELFE 1-6 reading comprehension test (sentence completion task; W. Lenhard & Schneider, 2006). In the plot, you can see the share of variance explained by the different models (with progressing number of predictors). Adjusted R2, Mallow's Cp (an AIC like measure) and BIC is used (BIC is available through the option type = 2). The predefined adjusted R2 value of .99 is already reached with the third model and afterwards we only get minor improvements in adjusted R2. On the other hand, Cp rapidly declines afterwards, so model 3 seems to be a good candidate in terms of the relative information content per predictor and the captured information (adjusted R2). 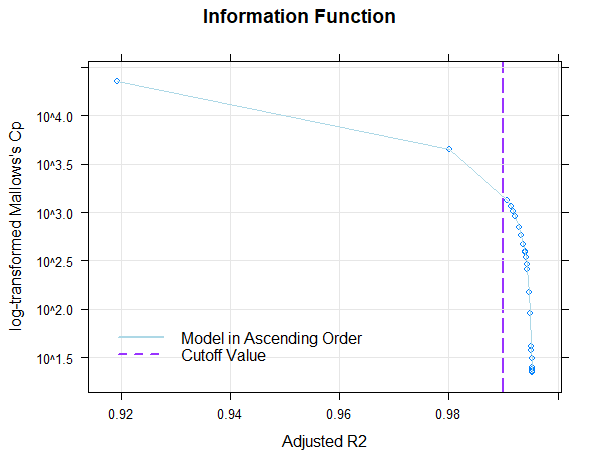 It is advisable to choose a model at the "elbow" in order to avoid over-fitting, but the solution should be tested for violations of model assumptions and the progression of the percentiles should be inspected visually, as well. The predicted progression over age are displayed as lines and the manifest data as dots. Only three predictors were necessary to almost perfectly model the norm sample data with adjusted R2. The package includes data from two large test norming projects, namely ELFE 1-6 (Lenhard & Schneider, 2006) and German adaption of the PPVT4 (A. Lenhard, Lenhard, Suggate & Seegerer, 2015), which can be used to run the analysis. Furthermore, large samples from the Center of Disease Control (CDC) on growth curves in childhood and adolescence (for computing Body Mass Index 'BMI' curves), life expectancy at birth and mortality per country from 1960 to 2017 (available from The World Bank). Type ?elfe, ?ppvt, ?CDC, ?mortality or ?life to display information on the data sets. cNORM is licensed under GNU Affero General Public License v3 (AGPL-3.0). This means that copyrighted parts of cNORM can be used free of charge for commercial and non-commercial purposes that run under this same license, retain the copyright notice, provide their source code and correctly cite cNORM. Copyright protection includes, for example, the reproduction and distribution of source code or parts of the source code of cNORM or of graphics created with cNORM. The integration of the package into a server environment in order to access the functionality of the software (e.g. for online delivery of norm scores) is also subject to this license. However, a regression function determined with cNORM is not subject to copyright protection and may be used freely without preconditions. If you want to apply cNORM in a way that is not compatible with the terms of the AGPL 3.0 license, please do not hesitate to contact us to negotiate individual conditions. If you want to use cNORM for scientific publications, we would also ask you to quote the source. Lenhard, A., Lenhard, W., Segerer, R. & Suggate, S. (2015). Peabody Picture Vocabulary Test - Revision IV (Deutsche Adaption). Frankfurt a. M./Germany: Pearson Assessment. This file documents the development of the package as well as open issues or points for further improvements. New contributor: Sebastian Gary, welcome to the team!